“Save the juice. Save the juice.” That comment is from a sign in Thomas Edison’s laboratory in Menlo Park, New Jersey. The rest of the of the sign rhymes, with the added line: “Turn off the lights when not in use.” Frugal guy, Edison. So taking that advice up to modern times, we took out our wallet, blew off the dust, and cracked it open to the tune of $10 to buy a timer for our phone charger. According to AccuBatteryApp.com, you can’t overcharge your phone’s battery, but leaving it plugged in too long is bad for its health; the battery degrades. Well, we do that a lot, and decided to take measures to overcome our lack of self- control. 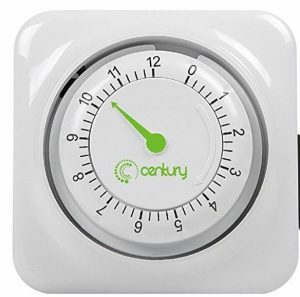 We bought the “Century 12-Hour Mechanical Timer,” $10 on Amazon. Here’s how it works: Take your phone adapter and plug it into the mechanical timer. Plug the timer into the wall. If you only want 15 minutes to top it off, you can do that. The timer lets you choose any setting up to 12 hours. You could also use it to automatically turn off appliances, like your iron. If despite all efforts and years of meditation you find that your phone runs out of battery much more quickly than anticipated, go to “Settings.” Your phone will show you which apps are using the most power. Go to the “Notifications” area to stop some apps from sending alerts. For example, we don’t need to hear from LinkedIn every time someone has a job anniversary. If you have an iPhone, don’t leave a frequently used app by just flicking it away. It uses less battery to let it run in the background, so the phone doesn’t have to load it all over again when you need it. A reader wrote that she upgraded to Windows 10 and could no longer get Windows Movie Maker to create a DVD. We suggested she try the version of Movie Maker made specifically for Windows 10. Then we discovered an oddity. On one page of the Microsoft site, they say there is no Movie Maker for Windows 10. It goes further, warning that if you download one, it could have malicious malware or viruses. On another page of the same website, they praise Movie Maker for Windows 10, with a link to download it. As with government agencies, apparently various departments – and people, don’t talk to each other. We’re adventurous, so we went ahead and downloaded it anyway from the Windows Store on our computer, which also offers a “pro” version. Our reader tried it too, but ran into a problem. She couldn’t add the music she usually adds to movies. We suggested converting them to another format using the free “VLC Media Player.” If you click on “Media,” then “convert,” you can change one format into another. Microsoft suggests using the Windows Photo app for creating videos instead of Movie Maker. Good advice and we agree. It lets you add captions and even 3D effects, and it’s easy to export or share your creation online. For offline, we used the free DVD burner from Ashampoo.com, “Burning Studio Free.” Movie Maker comes with some great choices for music but it’s not well designed. For example, there was no way we could start the music after we put together the video. So we did it all over again and made two videos. It was easy to use. Go to Drive.Google.com and move your cursor over the words “upgrade storage.” When we did it, we learned that we were using 14.5 gigabytes out of the allowed 15. Our Gmail is hogging most of that space, around 12 gigabytes. We dumped three gigabytes by deleting large emails; it’s the attachments that eat up the space. (Always remember to keep your messages — as we used to say in the newsroom — light, tight and trite.) Your Gmail trash empties every 30 days, as does your spam folder, so you can skip that part. If you want to go after your large emails with an axe, but don’t know where they are, type “size:5242880” into the search bar at the top of your Gmail screen: It will bring up every email larger than five megabytes. You can replace the “5” with any number you want and that will determine the starting size of the emails that come up. If you click on the drop-down arrow, you can choose dates. We chose 2005 to 2014, and deleted large emails from way back when. We also uncovered some great forgotten photos, which we downloaded to a separate file on our computer and posted them to a Facebook page. If you get a warning from Google that you’re still getting near the upper limit of storage space, transfer stuff to Flickr, Dropbox, OneDrive, or iDrive. They all give you lots of storage for free. Or, if you want to keep it in Gmail and Google Drive, you can get 100 gigabytes for $2 a month, or $20 for a year’s worth. “Portal AR, Step into Scotland.” If you have a phone with “AR,” which stands for “augmented reality,” this app will take you on a tour of Edinburgh Castle or whiz along the North Coast on a motorcycle. Other than the novelty of it all, we found the tour wanting and would not have tipped the guide. There are YouTube videos about Scotland that are much better. Despite all the buzz about augmented reality, most of it is really disappointing. 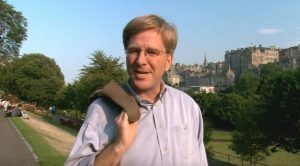 We liked the Rick Steves videos. He has a great one on Edinburgh.